GitHub - SteeltoeOSS/eShopOnContainers: Easy to get started sample reference microservice and container based application. Cross-platform on Linux and Windows Docker Containers, powered by .NET Core 2.1, Docker engine and optionally Azure, Kubernetes or Service Fabric. Supports Visual Studio 2017, VS for Mac and CLI based environments with Docker CLI, dotnet CLI, VS Code or any other code editor. Want to be notified of new releases in SteeltoeOSS/eShopOnContainers? Pull request Compare This branch is 18 commits ahead, 261 commits behind dotnet-architecture:dev. Sample .NET Core reference application, powered by Microsoft, based on a simplified microservices architecture and Docker containers. This fork exists to demonstrate Steeltoe libraries and deployment to Pivotal Cloud Foundry. The current supported Visual Studio version for eShopOnContainers is Visual Studio 2017 15.7 (GA/RTM since May 8th 2018) or later version. Note for Pull Requests (PRs): We accept pull request from the community. When doing it, please do it onto the DEV branch which is the consolidated work-in-progress branch. Do not request it onto Master branch, if possible. eShopOnContainers is updated to .NET Core 2.0 and 2.1 "wave". Not just compilation but also new recommended code in EF Core, ASP.NET Core, and other new related versions. The dockerfiles in the solution have also been updated and now support Docker Multi-Stage since mid-December 2017. IMPORTANT: The current state of this sample application is BETA, because we are constantly evolving towards newly released technologies. Therefore, many areas could be improved and change significantly while refactoring the current code and implementing new features. Feedback with improvements and pull requests from the community will be highly appreciated and accepted. 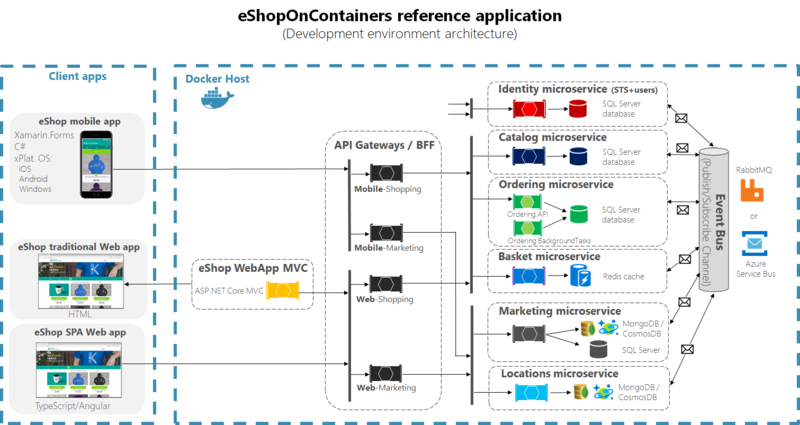 This reference application proposes a simplified microservice oriented architecture implementation to introduce technologies like .NET Core with Docker containers through a comprehensive application. The chosen domain is eShop/eCommerce but simply because it is a well-known domain by most people/developers. However, this sample application should not be considered as an "eCommerce reference model" at all. The implemented business domain might not be ideal from an eCommerce business point of view. It is neither trying to solve all the problems in a large, scalable and mission-critical distributed system. It is just a bootstrap for developers to easily get started in the world of Docker containers and microservices with .NET Core. For example, the next step after running the solution in the local dev PC and understanding Docker containers and microservices development with .NET Core, is to select a microservice cluster/orchestrator like Kubernetes in Azure (AKS) or Azure Service Fabric, both environments tested and supported by this solution. Additional steps would be to move your databases to HA cloud services (like Azure SQL Database) or switch your EventBus to use Azure Service Bus (instead of bare-bone RabbitMQ) or any other production-ready Service Bus in the market. Read the planned Roadmap and Milestones for future releases of eShopOnContainers within the Wiki for further info about possible new implementations and provide feedback at the ISSUES section if you'd like to see any specific scenario implemented or improved. Also, feel free to discuss on any current issue. This reference application is cross-platform at the server and client side, thanks to .NET Core services capable of running on Linux or Windows containers depending on your Docker host, and to Xamarin for mobile apps running on Android, iOS or Windows/UWP plus any browser for the client web apps. The architecture proposes a microservice oriented architecture implementation with multiple autonomous microservices (each one owning its own data/db) and implementing different approaches within each microservice (simple CRUD vs. DDD/CQRS patterns) using Http as the communication protocol between the client apps and the microservices and supports asynchronous communication for data updates propagation across multiple services based on Integration Events and an Event Bus (a light message broker, to choose between RabbitMQ or Azure Service Bus, underneath) plus other features defined at the roadmap. Since April 2018, we have introduced the implementation of the API Gateway pattern and Backend-For-Front-End (BFF) pattern in eShopOnContainers architecture, so you can filter and publish simplified APIs and URIs and apply additional security in that tier while hiding/securing the internal microservices to the client apps or outside consumers. These sample API Gateways in eShopOnContainers are based on Ocelot, an OSS lightweight API Gateway solution explained here. The deployed API Gateways are autonomous and can be deployed as your own custom microservices/containers, as it is currently done in eShopOnContainers, so you can test it even in a simple development environment with just Docker engine or deploy it into orchestrators like Kubernetes in AKS or Service Fabric. For your production-ready architecture you can either keep using Ocelot which is simple and easy to use and used in production by significant companies or if you need further functionality and a much richer set of features suitable for commercial APIs, you can also substitute those API Gateways and use Azure API Management or any other commercial API Gateway, as shown in the following image. The sample code in this repo is NOT making use of Azure API Management in order to be able to provide an "F5 experience" in Visual Studio (or CLI) of the sample with no up-front dependencies in Azure. But you could evaluate API Gateways alternatives when building for production. The microservices are different in type, meaning different internal architecture pattern approaches depending on its purpose, as shown in the image below. In this solution's current configuration for a development environment, the SQL databases are automatically deployed with sample data into a single SQL Server container (a single shared Docker container for SQL databases) so the whole solution can be up and running without any dependency to any cloud or a specific server. Each database could also be deployed as a single Docker container, but then you'd need more than 8GB of RAM assigned to Docker in your development machine in order to be able to run 3 SQL Server Docker containers in your Docker Linux host in "Docker for Windows" or "Docker for Mac" development environments. A similar case is defined in regard to Redis cache running as a container for the development environment. Or a No-SQL database (MongoDB) running as a container. However, in a real production environment it is recommended to have your databases (SQL Server, Redis, and the NO-SQL database, in this case) in HA (High Available) services like Azure SQL Database, Redis as a service and Azure CosmosDB instead the MongoDB container (as both systems share the same access protocol). If you want to change to a production configuration, you'll just need to change the connection strings once you have set up the servers in an HA cloud or on-premises. While developing this reference application, we've been creating a reference Guide/eBook focusing on architecting and developing containerized and microservice based .NET Applications (download link available below) which explains in detail how to develop this kind of architectural style (microservices, Docker containers, Domain-Driven Design for certain microservices) plus other simpler architectural styles, like monolithic apps that can also live as Docker containers. Download in other formats (eReaders like MOBI, EPUB) and other eBooks at the .NET Architecture center. However, we encourage you to download and review the Architecting and Developing Microservices eBook because the architectural styles and architectural patterns and technologies explained in the guide are using this reference application when explaining many pattern implementations, so you'll understand the context, design and decisions taken in the current architecture and internal designs much better. In this repo you can find a sample reference application that will help you to understand how to implement a microservice architecture based application using .NET Core and Docker. The example business domain or scenario is based on an eShop or eCommerce which is implemented as a multi-container application. 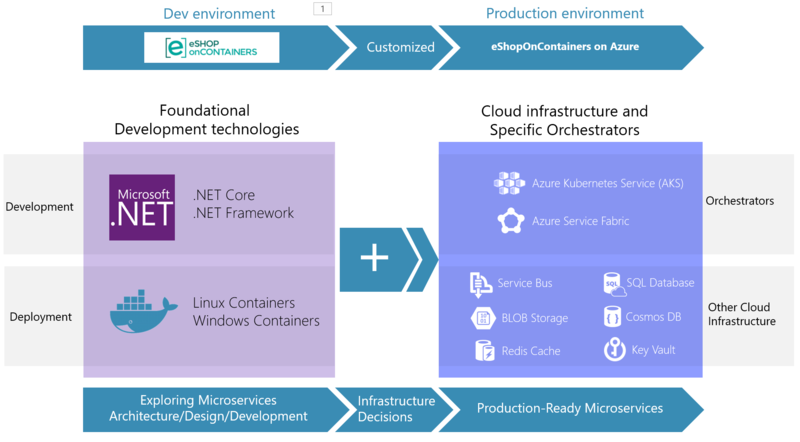 Each container is a microservice deployment (like the basket-microservice, catalog-microservice, ordering-microservice and the identity-microservice) which is developed using ASP.NET Core running on .NET Core so they can run either on Linux Containers and Windows Containers. The screenshot below shows the VS Solution structure for those microservices/containers and client apps. (Recommended when getting started) Open eShopOnContainers-ServicesAndWebApps.sln for a solution containing just the server-side projects related to the microservices and web applications. Open eShopOnContainers-MobileApps.sln for a solution containing just the client mobile app projects (Xamarin mobile apps only). It works independently based on mocks, too. Open eShopOnContainers.sln for a solution containing all the projects (All client apps and services). Finally, those microservices are consumed by multiple client web and mobile apps, as described below. MVC Application (ASP.NET Core): It's an MVC application where you can find interesting scenarios on how to consume HTTP-based microservices from C# running in the server side, as it is a typical ASP.NET Core MVC application. Since it is a server-side application, access to other containers/microservices is done within the internal Docker Host network with its internal name resolution. Xamarin Mobile App (For iOS, Android and Windows/UWP): It is a client mobile app supporting the most common mobile OS platforms (iOS, Android and Windows/UWP). In this case, the consumption of the microservices is done from C# but running on the client devices, so out of the Docker Host internal network (Like from your network or even the Internet). See at the Wiki the posts on setup/instructions about how to deploy to Kubernetes or Service Fabric in Azure (although you could also deploy to any other cloud or on-premises).